November 18, 1899: “PINMORE SOLD ==Mr. J. J. Miller has sold the Pinmore mine near Johannesburg, to Ballarat parties. The purchase price could not be learned, nor the terms, but enough was discovered to know that it is a sure enough sale, the purchasers having made a liberal cash payment and secured the balance. The purchasers are R. F. Harrison, W. W. Godsmark, Fred Hisom, M. Sharidan, all of Ballarat, and W. J. Colson of Johannesburg, and they are in possession. 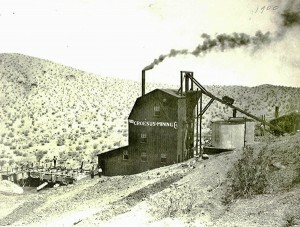 They have bought the Visalia 10-stamp mill at Garlock and will move it up, erect it at the mine and fit it with the latest gold saving apparatus. They have also contracted for water and will begin taking out ore at once.